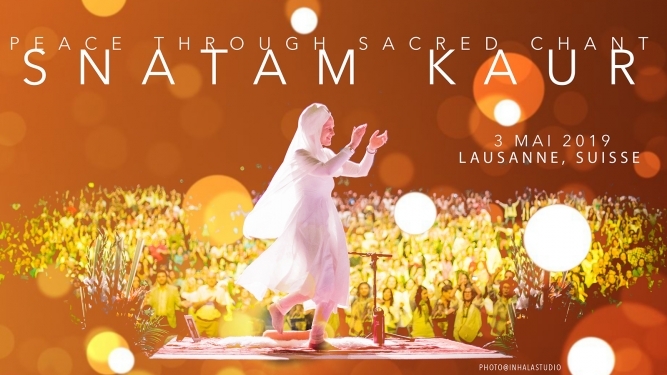 Snatam Kaur comes for the first time to Lausanne on her "Peace Through Sacred Chant Tour" on 3rd May 2019! In 2018 her "sacred" concert in Zurich was sold out with over 2000 people! Crystal clear and radiant, Snatam's voice opens the door to the simple and powerful truth of the heart. Snatam's divinely melodic songs based on traditional Sikh mantras are augmented by simple, heartfelt English verses that express the meanings these sacred syllables hold and help the audience forge their own emotional connection. Snatam accompanies herself on harmonium, as well as violin and guitar. The harmonium and tablas ground the sound in Punjabi Sikh musical tradition, but the music also has a decidedly Western flavor. Most of the concert songs are done in the call-and response kirtan tradition, which builds an energetic momentum that palpably fills each concert space. Wheelchairs: Please contact the organiser at info@universalsounds.ch.